We have developed a novel integration platform that conveniently merges InP and GaAs devices with SiPh in a backend processing step. Light is coupled between layers using grating couplers and total internal reflection (TIR) turning mirrors. 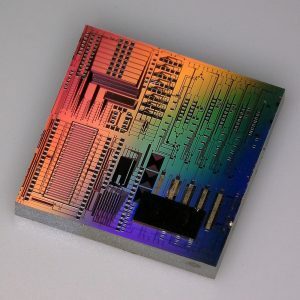 This integration platform enables laser integration for silicon photonics and multi-chip photonic interposers. An important feature is superior heat dissipation that yields a 3X improvement in thermal impedance compared to other approaches. 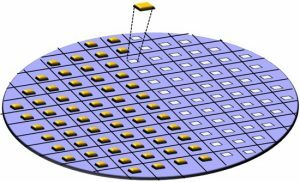 In addition to being featured in the OSA Optics and Photonics News magazine, this work was twice selected as a finalist for the Tingye Li Innovation Prize and was recognized with a best paper award at the 2017 Asia Communications and Photonics Conference. “3D Integrated Hybrid Silicon Laser,” Optics Express, vol. 24, no. 10, pp. 10435-10444, 2016. 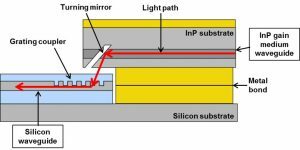 “High-Thermal-Performance 3D Hybrid Silicon Lasers,” Photonics Technology Letters, vol. 28, no. 14, pp. 1143-1146, 2017. “Tunable 3D Integrated Hybrid Silicon Laser,” Asia Communications and Photonics Conference (ACP), paper Su3L.3, 2017. “Tunable 3D hybrid integrated silicon photonic external cavity laser,” Integrated Photonics Research, Silicon and Nanophotonics Conference (IPR), paper ITu3B.3, 2016. “Thermal Performance of 3D Integrated Silicon Laser,” Conference on Lasers and Electro-Optics (CLEO), 2017. “3D Integrated Silicon Photonic External Cavity Laser,” Conference on Lasers and Electro-Optics (CLEO), paper SM4G.5, 2016. “3D Integrated Hybrid Silicon Laser,” European Conference on Optical Communication (ECOC), paper We2.5.5, 2015. “3D Integrated Silicon Photonic External Cavity Laser (SPECL),” IEEE Photonics Conference, paper Tue3.2, 2014.